The Air Jordan line of sneakers is one of the most successful and widely-recognized in the industry. Collectors frequently shell out large sums of money (thousands, in some cases) to obtain rare colorways and original releases. Last night, at midnight, one of the rarest and most popular Air Jordan models went on sale across the country. 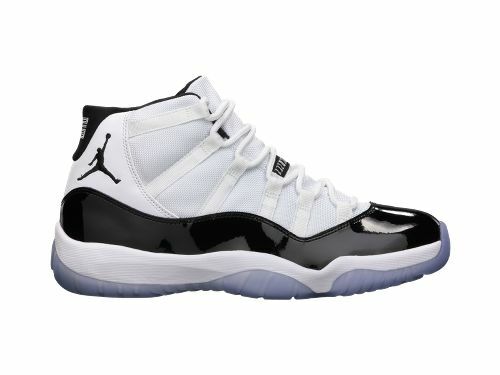 The XI “Concords” were worn by Jordan during the 1995-1996 NBA Championship season, on the silver screen in Space Jam. The most interesting part of these sneakers is that they were “sampled” during the playoffs of the year of Jordan’s first return (1995). Designer Tinker Hatfield and Nike did not want Michael Jordan playing in them, however, when the sample was completed, Jordan saw it, took it, and said he wanted to wear the shoe. Nike and Hatfield hoped that he would not wear it during the playoffs against Orlando, however, when they tuned in for the game, Ahmad Rashad was holding the shoe for the cameras explaining that they were the “newest” Air Jordan. Hatfield and Nike were highly upset as the shoe was not even in production, and now they would be forced to produce it for the masses. The excitement surrounding this re-release was akin to a new iPhone model for Apple fans, and with Christmas upon us, the demand is tremendous. In addition to traditional shoe stores, Nike also made the Jordans available through their website, and took to Twitter with customer support. Notably, there is a bug with iOS 5 that prevents customers from completing an online purchase if the first digit of their zip code is a zero. The Twitter account was also used to answer questions about shipping, order details, and to share the link to the order page at the stroke of midnight. Throughout the process, frequent updates were made about the email confirmations being slow, the site experiencing heavy load, sizes that ran out, and responses to demanding customers, and the inevitable sold out update (which came just 57 minutes after they were announced).